The weather has been pretty chilly these last few days in New York. I’m on the verge of breaking out my winter coat, but I’m trying to resist! In the meantime, I’m wearing my favorite scarves and other cool weather gear to keep warm. Now is the perfect time to shop for cute cold weather accessories, so I’ve rounded up my faves! Isn’t it annoying how stores start clearing out winter clothes and accessories in January, right when the weather really starts to get cold? One year, I needed a new pair of gloves in February and there was nothing to be found anywhere. That was a cold winter, and I’ve since learned my lesson to stock up before it’s too late. Here in New York, I walk everywhere and a warm scarf and pair of gloves are a daily necessity, and usually a hat, too. And don’t forget boots for those snowy days! It’s actually pretty amusing to see how bundled up people get at the slightest temperature drop! Before they’re sold out, I thought it would be fun to roundup my favorite cold weather accessories – gloves, hats, scarves, and boots – everything you need to keep warm this winter! 1. I love the bright color and pattern on these Isotoner Wool Houndstooth smarTouch Texting Gloves. They come in green or grey, too, if purple is not your thing. 2. Arm warmers are perfect for those times you need your fingers free. The cute pattern on these MUK LUKS Arm Warmers have a fun boho vibe. 3. These Isotoner Wool Bow smarTouch Texting Gloves are super ladylike and come in a variety of colors to match your coat. 4. Treat yourself to a pair of Nordstrom’s Touch Tech Cashmere Gloves! They come in a rainbow of colors and are great price for cashmere. 5. The button detail adds a sweet touch to these Tulle Moto Style Gloves, which also come in creme brulee and fiery red! 6. This Felt Buckle Cap from San Diego Hat Company is so sharp. Wear it when you need to look pulled together. 7. I love the unique turban-esque look of ModCloth’s Where There’s a Chill Hat! It’s a cute twist on a traditional shape. 8. Keep your ears perfectly toasty with ModCloth’s Orinoco Flower Earmuffs. They have a great handmade quality. 9. Who can resist a hat with a pom pom? Not me! Even better, this Simply Vera Vera Wang Knit Hat from Kohl’s is only $5, and 100% of the net profit from its sale supports the fight against breast cancer. 10. I’ve been coveting a pair of (faux) fur earmuffs, and these Juicy Couture Glamour Girl Earmuff Headphones are pretty perfect. They even have a studded headband and built in headphones (great for commuting). 11. How gorgeous is this Missoni Infinity Scarf? It’s on sale and a deal for Missoni, although still a splurge. It’s a classic piece you’ll wear forever though. 12. Dress up your coat with a little animal print and sparkle! This Calvin Klein Leopard Jacquard Shimmer Scarf has the perfect amount of both. 13. There are so many things going for Tulle’s Scarf with Pockets and Bows: it comes in 6 pretty colors, it’s adorable, and it’s a great price, too! 14. This Hat Attack Faux Fur Pull Through Scarf is the perfect accessory to take your plain coat from drab to glam with no effort. 16. Keep your toes toasty with Bogs Rider Embossed Boots. They’re waterproof, fleece-lined, and have a cool pattern. Plus, they’re temperature rated at -40 degrees (hopefully, you’ll never need to test that bit!). 17. I can totally picture myself tracking through a snowy Central Park in Sorel’s Tofino Cate Boots. They’re waterproof, have a cozy sherpa pile lining, and have a cute yet rugged vibe that I love! 18. These Hunter Original Adjustable Wellies will take you from winter snowstorms to spring showers. I love the pop of bright pink (although they come in other colors, too). Pair them with Hunter Welly Socks to keep your feet extra warm. What is your favorite winter accessory? 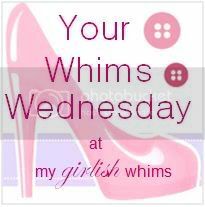 I’m linking up with Your Whims Wednesday , The Pleated Poppy’s What I Wore Wednesday, Get Your Pretty On’s I Feel Pretty, The Life of the Party’s Fashion Informant, Vodka Infused Lemonade’s Tre-Chic Thursday, All Things Thursday, Simply Lulu’s Style’s What I’m Loving Fridays, Style Elixir’s Friday’s Fab Favorites, Be.You.Tiful Link Up Party, and Totally Posted Tuesday.